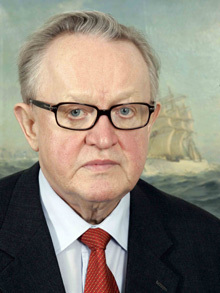 Martti Ahtisaari was born in Viipuri, Finland (now Vyborg, Russia), and began his career in diplomacy working as a school administrator in Pakistan, on a project co-sponsored by the YMCA and the Swedish government. He became a student activist while attending the Helsinki School of Economics and Business Administration, and then spent nearly three decades working in foreign relations, including an assignment at the UN office that shepherded Namibia to independence in the late 1980s and several years as Finnish Secretary of State. In his first and only run for elected office, he won the Finnish Presidency in 1994. During his six-year term he campaigned for acceptance of the European Union, Finland became the first Nordic nation to adopt the Euro currency, and his nation built of one of the world's most advanced telecommunications networks. In 1999, Ahtisaari and Russian envoy Viktor Chernomyrdin convinced President Slobodan Milosevic of Yugoslavia to accept a negotiated end to the conflict in Kosovo. After leaving office in 2000, Ahtisaari founded the Crisis Management Initiative (CMI), an independent non-profit organization that works in crisis management and conflict resolution. In 2005 Ahtisaari and CMI negotiated a settlement between Aceh rebels and the Indonesian government, ending thirty years of warfare. He was awarded the Nobel Peace Prize in 2008. His son, Marko Ahtisaari, was a long-time bassist for the Finnish-American rock band Afterimage, and is presently an executive with the Blyk free mobile phone network.